The Location Number is a 10 digit number specific to your service location -i.e. the address where you receive service. It is unique to that address, and there are no duplicates. A customer may have multiple locations, if they have multiple properties, or multiple dwellings on a property. Your Account Number is a 10 digit number unique to you as a customer. Most customers will only have a single account number, and all their service locations will be visable under this one account. You will need your account number to make phone or internet transactions with us. This is the date the bill is printed and sent to the post office. All due dates, and suspension dates are based from this date. This is a date approximately 20 days from the bill date. Please pay by midnight on this date. If you pay after the due date, a $15.00 late fee is added to the Total Due. These date fields indicate your billing period, which will be roughly 60 days. 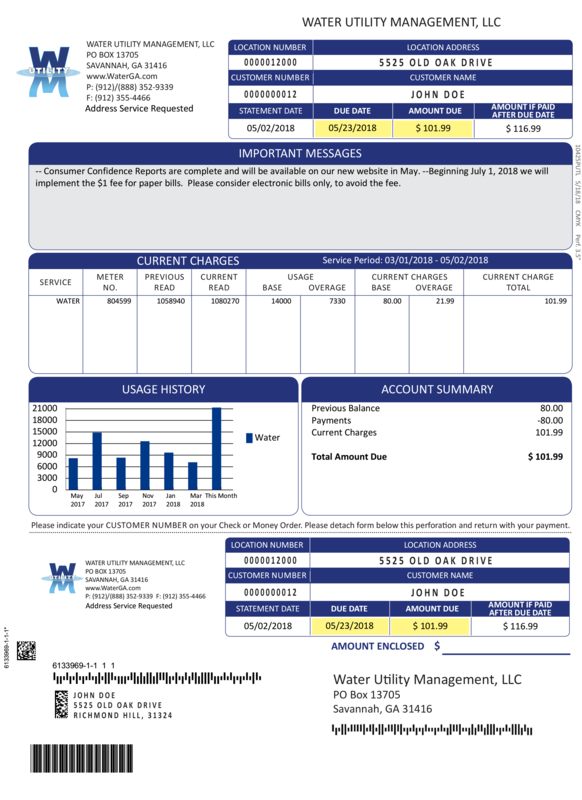 By subtracting your previous meter read from your current read, we determine how much water has been consumed over the billing period. This consumption is the basis for water and sewer charges. If you are moving out of a service location, we will apply your deposit (if applicable) and mail a final bill to close your service with us. When you request to terminate service, we will dispatch a technician to get a final reading from your meter. Your final bill will use the final reading, and will account for all services and usage from your last bill until the move-out date. We calculate your bill based upon your consumption according to your rates. We add any fees or past-due amounts, and subtract any applicable credits to calculate your total bill. If you pay after the due date, a $15.00 late fee is added to your Total Due.